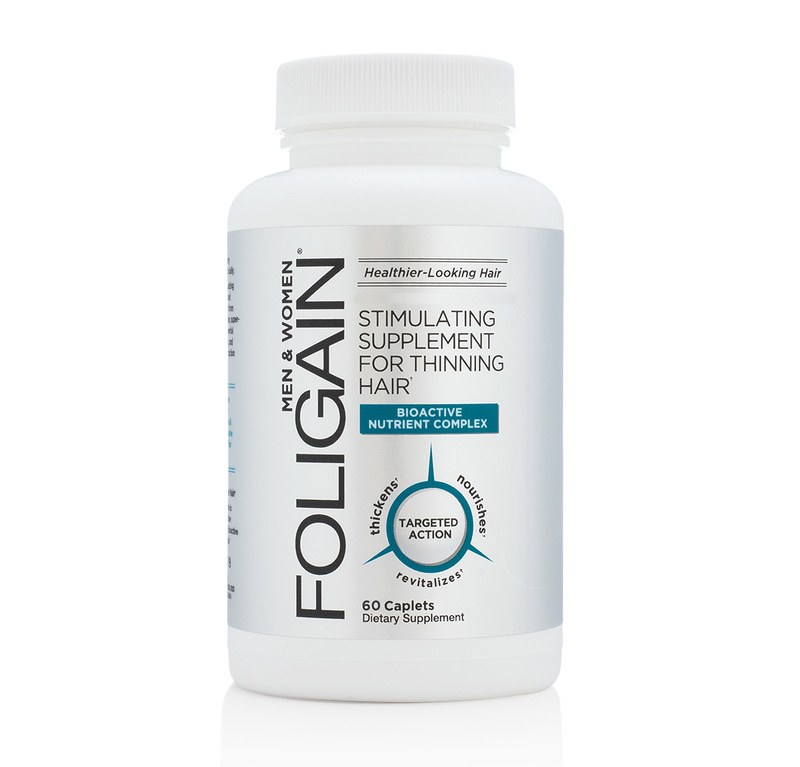 How does Foligain stimulating supplement for thinning hair work? What are the key ingredients in Foligain? Foligain combines natural vitamins, minerals, DHT blockers, and compounds that promote the growth of thick, healthy-looking hair. Ginkgo Biloba Leaf Extract: Ginkgo Biloba fastens blood flow to important peripheral part of human body along with fine capillaries thus directly affecting scalp parts. Blood carries oxygen with it so if there is more blood flow there is automatically more oxygen supply, oxygen brings more nutrients with it and all in all essential vitamins E & A give a new lease of life every time to the scalp. Saw Palmetto Berry Extract: Works by interrupting hormonal signals and therefore reducing the uptake by the hair follicles of a damaging chemicalcalled dyhydrotesto­sterone (DHT). DHT is also responsible for shrinking hair follicle with which the hair follicle gets smaller and finer. This is referred to as miniaturization with which the hair ultimately falls off. This is how DHT is responsible for about 95% of hair loss. The men or women who lose more hair are those who are genetically pre-disposed in producing more DHT than others. Nettle Leaf Extract: Nettle herb is an exceptional plant for restoring health and beauty to your hair. Nettle works on the inside of your body as well as the outside. Rich in minerals and vitamins to nourish every system in your body, nettles will make your hair grow, gleam, get thick and darken. An added bonus is smooth, clear skin and hard nails. Folate: Because folate is important in tissue growth and cellular function, it is essential for your body to have enough of it to produce healthy skin, nails and hair, because these body parts must regenerate rapidly. Folic acid therefore helps prevent hair loss. It also may be a factor in keeping your hair from becoming gray. Biotin: Biotin is a major component in the natural hair manufacturing process it is essential to not only grow new hair, but it also plays a major role in the overall health of skin and nails. Iodine: Iodine can affect hair loss because it directly affects your thyroid gland, which in turn, directly affects the health of your hair follicles. Hair follicles are delicate and very susceptible to being damaged. Healthy hair follicles grow shiny, thick, healthy hair, while unhealthy follicles lead to just the opposite. Zinc: Deficiency in zinc can contribute a lot to hair shedding because without zinc and other related minerals, you hair shafts get weakened, causing hair breakage and very slow hair regrowth. Zinc benefits for hair include promotion of cell reproduction, tissue growth and repair of broken tissues. It also maintains the oil-secreting glands that are attached to your hair follicles, thus decreasing their chances of falling off. Copper: Copper helps to form hemoglobin in the blood cells and helps to carry the oxygen in the red blood cells. A diet deficient in copper does not help the body to make the hemoglobin needed to carry sufficient blood supply to the hair roots. When hair does not get the vitamins and minerals that it needs, it will die and fall out. The amount of hair loss you experience as a result of this depends on the extent of the copper deficiency. Niacin: Since niacin has a dilating effect on vessels and capillaries it is thought to be increasing circulation to the scalp and stimulating hair growth. Vitamin B6: Vitamin B6 is thought to prevent hair loss and help create melanin, the pigment which gives hair its color. Pantothenic Acid (Vitamin B5): Prevents graying and hair loss. Beta-Sitosterol: Beta sitosterol is a natural plant extract used to stop hair loss in men and women. It has androgen-blocking properties which enable it to target the hormones responsible for male and female pattern baldness. When taken orally as a daily supplement, beta sitosterol has been shown to work best on men and women who have only recently noticed excessive hair loss or signs of premature balding. It's less effective on people who have had significant hair loss over the years. Taurine: In a 2006 French study published in the "International Journal of Cosmetic Science," researchers confirmed that when the follicle's bulb takes in Taurine, it increases hair survival in vitro (test tubes) and prevents a specific inhibitor of hair growth called TGP. Jaborandi Leaves: Strengthens hair against breakage and loss. Promotes hair's natural shine. American Ginseng Root Extract: Ginseng is a wonderful herb that has many benefits. One of these is that it increases stimulation and improves circulation. This has helped those who are suffering from hair loss or weak and damaged hair. Ginseng will also remove any toxins that may be clogging your hair follicles, slowing down or stalling new hair growth. What Can I Expect When Using Foligain? Calcium carbonate, MCC, vegetable stearic acid, sodium croscarmellose (modified cellulose), vegetable magnesium stearate, confectioners glaze. Take 1-2 caplets daily, for instance during breakfast and before going to sleep.